Well, what a dramatic title, and it is certainly an unabashed rip off from Winston Churchill too! However, many growers in California view the threat posed to the long term viability and profitability of citrus by Asian citrus psyllid (ACP) and huanglongbing (HLB) as a war! ACP is a small sap sucking insect that is native to the Indian subcontinent and it has emerged as a global threat to citrus because it vectors a bacterium (Candidatus Liberibacter asiaticus [CLas]) that causes a lethal and incurable citrus disease, huanglongbing (sometimes referred to as citrus greening). Trees displaying HLB go into decline and some varieties may die in as little as 5-8 years post-infection. Symptoms may include chlorotic leaves (Fig. 2) and premature fruit drop. Fruit that are retained become misshapen as they develop, ripen irregularly (hence the common name citrus greening), and have a bitter taste. Florida's “war” with ACP and HLB started around 1998 when the psyllid was first found, then in 2005 the first citrus trees with HLB symptoms were discovered. Some economic estimates of the ACP-CLas epidemic in Florida suggest that more than 8,000 jobs have been lost, production has declined by 23%, and revenues have dropped by 16% . ACP was first detected in southern California in 2008, and in 2012, the first citrus trees with HLB symptoms were found in Hacienda Heights in Los Angeles County. Subsequently, HLB has been confirmed in San Gabriel, also in LA County. 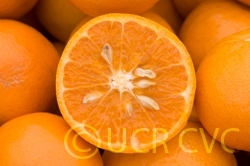 Detections of ACP in the San Joaquin Valley (SJV) are increasing, especially around Bakersfield, and these finds make the largest citrus production areas in California highly vulnerable to CLas. One response to the ACP invasion has been to go after the vector in urban residential areas where ACP enjoys a relatively good life on backyard citrus trees that are treated infrequently with pesticides. 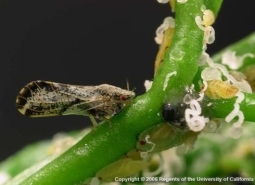 The intention of this urban-residential-ACP control program was to knock back psyllid numbers to low levels with the goal of reducing the rate of spread of ACP and CLas through urban areas and into commercial citrus production zones. Vector reduction have been attempted in two different ways; spraying insecticides and biological control. The California Department of Food and Agriculture aggressively pursued residential spraying of citrus during the initial stages of the ACP campaign in southern California, but this quickly became unsustainable due to cost and the speed at which ACP was spreading through the urban landscape. Spraying is still used in areas were ACP populations are small and localized, such as those being found in parts of the SJV. The second approach has been to run a classical biological control program targeting ACP. Classical biological control introduces natural enemies from the home range of the pest into the invaded area with the goal of establishing these beneficial agents so that they permanently suppress pest populations to less damaging levels. This approach necessitated searches for ACP natural enemies in the native range of the pest, a process referred to as foreign exploration. Because ACP has a huge putative native range, foreign exploration was conducted in Punjab Pakistan (Fig. 3), an area with ~70% climate match with the major citrus production areas in the SJV. A good climate match, in theory, should result in natural enemies that are pre-adapted to California's hot dry summers and cool damp winters. From September 2010 to April 2013, six expeditions searching for ACP natural enemies were conducted in Pakistan. The University of Agriculture Faisalabad (UAF) was the home base for this project. Collaboration with UAF Faculty was excellent, and the Vice Chancellor of UAF, Dr. Iqrar Khan, is a UC Riverside graduate in plant pathology, and Mike Roose was Iqrar's major professor! 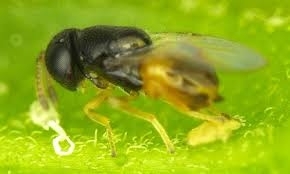 Two species of parasitoid, Tamarixia radiata and Diaphorencyrtus aligarhensis, were found attacking ACP in Pakistan. Both species were returned to the Insectary and Quarantine Facility at UC Riverside. Mandatory host range and host specificity tests were conducted over a 2-3 year period and results indicated that both species likely posed little environmental risk to California and it was concluded that both species offered significant benefits because of their ability to parasitize and feed on ACP nymphs. Both of these processes kill ACP nymphs. Consequently, USDA-APHIS issued release permits and CDFA took over the mass rearing of these parasitoids. As of June 2016, more than 3 million Tamarixia and 170,000 Diaphorencyrtus have been released in southern California. Initial results of the ACP biocontrol program are promising. Tamarixia appears to have established widely in southern California, and in combination with other species of natural enemies, especially generalist predators like lacewing and syrphid fly larvae, significant reductions in ACP populations have been documented. Diaphorencyrtus lags behind Tamarixia because it was the second parasitoid out of the quarantine pipeline, but multiple recoveries have been made at about 60% of sites where this species has been released. However, the impact and rate of spread of Diaphorencyrtus and whether it can compete successfully with Tamarixia is unknown and the subject of Citrus Research Board (CRB) and USDA-MAC sponsored research. 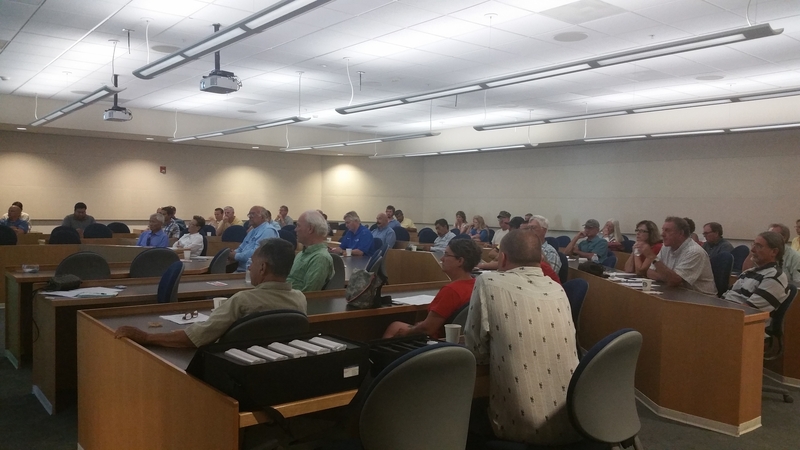 The Citrus Research Board in conjunction with the University of California Cooperative Extension (UCCE) held their annual grower seminar on Tuesday, June 30, 2015 at the University of California, Riverside (UCR) Palm Desert Center. 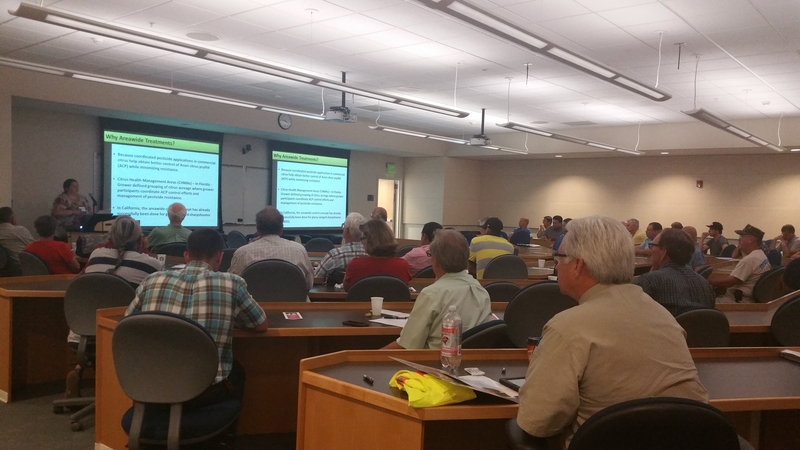 Seminars also took place in Santa Paula, CA on June 25th and in Exeter, CA on July 1st. Speakers from all over the state from different agencies shared their knowledge and expertise with the group. Mark Hoddle, a Biological Control Specialist at UCR gave an update of the biological control of Asian citrus psyllid (ACP). The ACP's natural enemy, Tamarixia radiata has been successful since its release in Southern California in 2011. The Tamarixia kills the ACP nymphs either by parasitizing them (i.e., females eggs laid underneath ACP nymphs and the parasitoid larvae burrow into the nymph to feed which kills the pest) or by host feeding (i.e., female parasitoids stab the nymph with their ovipositor, a tube that they use to lay eggs, and they feed on the body juices that leak from these wounds. This kills the nymph too). Hoddle reminded us, in order for this biocontrol program to continue to be successful, ant populations must be controlled. ACP nymphs produce a white, sugary waste product called honeydew, a good carbohydrate source for the ants, therefore, the ants will protect the nymphs from Tamarixia. His current research showed that when an ant population is reduced, parasitism control increases significantly. Hoddle and his lab will be testing different organic and conventional pesticides for their efficacy against Argentine ants in citrus orchards. For example, he is in the works of helping produce a more effective ant-bait by working on a biodegradable hydrogel. These hydgrogels are made from algae and crab shells. The material is engineered to encapsulate a 25% sucrose solution with a tiny amount of pesticide and ant pheromone. The liquid bait "leaks" onto the surface of the hydrogel, ants drink it, take it to the nest and slowly intoxicate the queen and nest mates. The baits, about the size of a jellybean, will be engineered to have a certain life time before they "dissolve". He anticipates these jellybean like baits being able to be broadcasted under trees (like you would slug/snail pellets) and the pheromone will attract the ants to them. Once they start to feed, the ants will lay down their own trails to the baits. Mark Hoddle is also the director of the Center for Invasive Species Research, for more information regarding his work on biocontrol, please visit: http://cisr.ucr.edu/. Fig. 1. 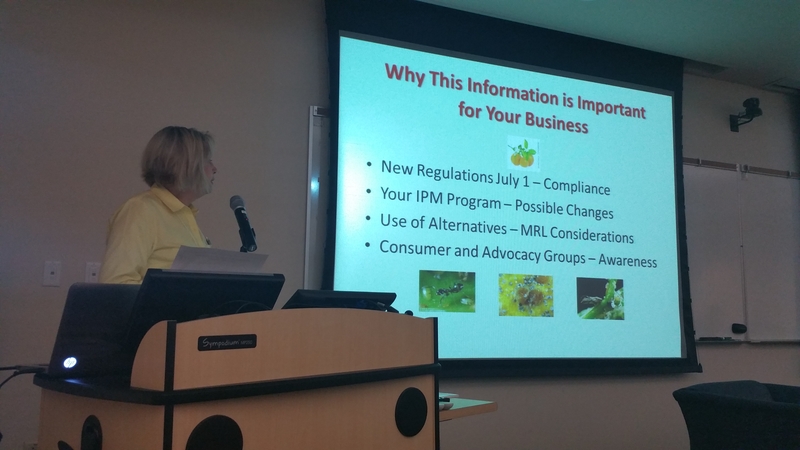 Victoria Hornbaker, from the California Citrus Pest & Disease Prevention Program Manager gave updates on the current ACP management areas. Fig. 2. 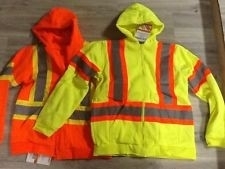 ACP is attracted to bright colors, such as yellow, which is a common color for most safety vests and jackets. prior to getting in vehicle can help the spread of ACP. For more information regarding ACP or quarantine sites in the state, please visit: http://www.cdfa.ca.gov/plant/acp/index.html. Lori Berger, with the UC Statewide Integrated Pest Management (IPM) Program gave an update on the Chlorpyrifos Critical Use Project (Fig. 3). The project is a multi-year effort to identify the pest management needs and practices for use of Chlorpyrifos in important crops in California. To accomplish this goal, Department of Pesticide regulation (DPR) contracted with UC IPM program to convene industry leaders to work together to create commodity specific guidelines for specific cropping systems. 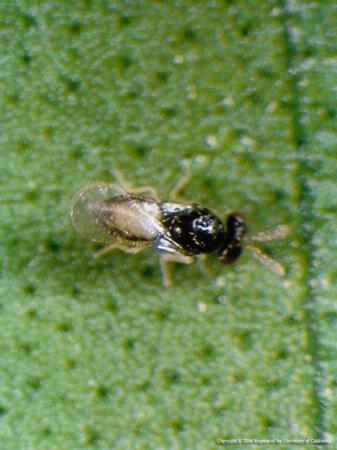 Chlorpyrifos is used on critical citrus pests such as ants, ACP, scales, bud mite, leafminers and many other arthropods. Growers are required to now obtain a restricted materials permit from their local County Agricultural Commission since DPR has designated the insecticide for restricted use in California as of July 1, 2015. The permit conditions may include buffer zones near sensitive sites, good management practices to reduce drift or offsite movement into the air and measures to reduce runoff into surface waters. For Southern California growers, a more in depth meeting will be held at the San Diego Farm Bureau in Escondido on September 15, 2015, more information on this meeting will available in the near future. DPR hours for laws and regulations will be available. More information on the Chlorpyrifos Critical Use Project can be found at: http://www.ipm.ucdavis.edu/IPMPROJECT/CDPR_Chlorpyrifos_critical_use_report.pdf. Ben Faber, a UCCE Farm advisor from Ventura/Santa Barbra County gave a great presentation on how to interpret soils/water/leaf analyses and managing water in a drought. Soil and water reports are best used for identifying problems in: 1) pH (power of hydrogen); 2) salinity (how much salt is in the soil); 4) chloride (Cl-); 5) sodium (Na+); 6) boron (B); and 7) sodium adsorption ration. Most of the issues listed can be managed by leaching. Unfortunately, there are no definite measurements for fertility management of perennial crops, however, understanding the fundamentals of interpreting analyses is key for a healthy producing grove. For example, when one is handed a report, many may get overwhelmed by the sight of all these things that are reported. Many of those numbers are only on there because they are required to be there by law and may not have an importance to you as grower when it comes to management decisions. You may ask yourself, what is really important in all this? Faber, gave the growers a quick review, for example, in a water analyses we would want to look for look for some basic ranges in: Boron, this element should be no higher than 1 parts per million (ppm), sodium and chloride no higher than 100 ppm, and the TDS (total dissolved solids), this may also be known to some as EC (electrical conductivity), should be no higher than 1,000 ppm. Simple, right? When dealing with pH, it is always best to balance that out before one plants trees. Trying to balance the pH after a crop has been established can be challenging and you may run the risk of injuring or killing your trees in the process. Those that would like to learn more on soils/water/leaf analyses and managing water in a drought, you can visit Ben Faber's UCCE County website: http://ceventura.ucanr.edu/Com_Ag/Subtropical/. Neil McRoberts. Professor of Plant Pathology from UC Davis had interactive question and answer session with the audience, gathering grower's views on approaches of control for ACP/ Huanglongbing, also known as citrus greening disease. The answers to this survey will be helpful in creating a management plan to better help growers with their ACP treatment and preventative planning. Michelle Richey, assistant Director of Food Safety from Ott and Davison Consulting also gave a quick update on Food Safety and Good Agricultural Practices certification. She stressed on how important it is to keep records of everything that happens in a business and to have them accessible. We had a great turn out and hope to see more growers at next year's Southern California meeting. Mark Hoddle of UC Riverside Entomology Department has intorduced a second species of natural enemy of Asian Citrus Psyllid (ACP), Diaphoencyrtus aligarhensis, imported from Punjab, Pakistan. It was officially released December 16, 2014 at the Biological Control Grove at UCR. It is anticipated that this natural enemy will be complimentary to Tamarixia radiata, a parasatoid that also attacks ACP nymphs that was released in California in 2011. It's thought that it might occupy slightly different environments where it might be more successful than Tamarixia. Hope for Citrus and HLB? This is a country that is surrounded by countries with huanglongbing. It's also the country where Mark Hoddle, Biocontrol Specialist from UC Riverside, collected Tamarixia radiata , the tiny wasp that is helping control Asian Citrus Psyllid. Pakistan has invested heavily in juice plants just for this industry which was established with this selection that came out of the Citrus Research Station breeding program in the 1930's. It makes me wonder if there might be a significant tolerance to this citrus disease in this mandarin variety. There has been a lot of work by both USDA and U. of Florida evaluating citrus varieties for tolerance to HLB. A wide range of tolerances have been noted. Fred Gmitter along with others are involved with this work and find that under different climatic conditions, resistance can vary. In the 'Kinnow' variety, it looks like there is hope in finding a variety that can be used to breed tolerance into other varieties. The fruit itself is noted for its juiciness and sweetness. But as you can see from the photo, it's got a lot of seeds.